Today is the final day of classes at QSDS, the Quilt Surface Design Symposium. Traveling from classroom to classroom, I have been looking at a lot of lines. There have been colorful fabrics carefully pieced into impossibly skinny lines, parallel rows of machine stitching, lines cut and fused from bright, bold prints, hand-stitched lines and lines created by drawing, stamping or painting. In a mixed media class, ridges of corrugated cardboard share tables with curving queues of colored staples. 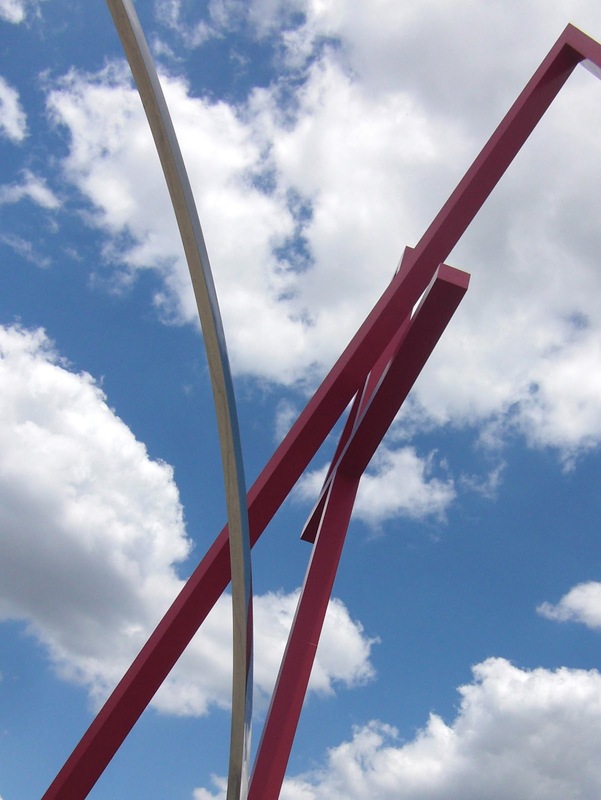 Walking across the campus, there is a spot where I can stand near a large ring-shaped sculpture and look up at the soaring red metal ART sculpture that is the local landmark. There they were, silver crossing red: lines set against a perfect sky.